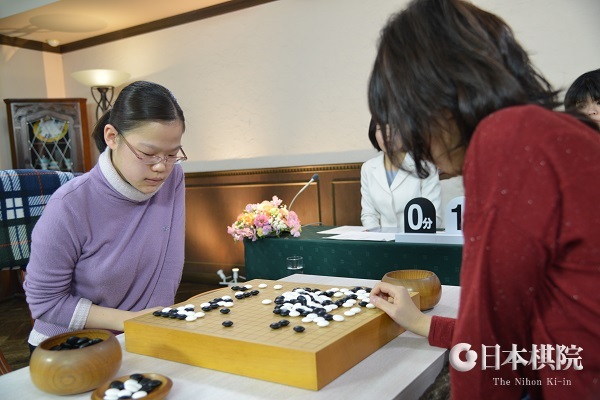 Xie starts well in Women’s Kisei, Nyu catches up: The first game of the 20th Docomo Cup Women’s Kisei title match, a best-of-three, was played at the Hotel Sunrise Garden in Hiratsuka City, Kanagawa Prefecture on January 19. This year the challenger is the 17-year-old Nyu Eiko (left). A disciple of Michael Redmond, who is her mother’s brother-in-law, she became a professional at the Nagoya branch of the Nihon Ki-in last year. Nyu quickly showed promise and has already represented Japan several times in team tournaments. In the opening game of the title match, Xie Yimin (White, at right), the defending champion, showed the benefit of greater experience and forced a resignation after 154 moves. However, Nyu fought back in the second game, played in the Ryusei Studio in the basement of the Nihon Ki-in in Tokyo on January 30. Taking white, Nyu forced a resignation after 186 moves. The fate of the title will be decided on February 6. Cho U wins 900th game: Cho U (right) has become the 25th Nihon Ki-in player to reach the benchmark of 900 wins. In a game in Preliminary C of the 43rd Gosei tournament, played on January 19, Cho (black) beat Kim En 4P by resig. This took his record to 900 wins, 388 losses, 2 jigo, and 1 no-result. At 36 years 11 month, Cho is the youngest player to win 900 games (putting Yamashita Keigo, at 37 years two months, into 2nd place); at 22 years nine months, he is the 2nd fastest (top is Yamashita at 22 years seven months); his winning percentage of 69.9 is the 2nd highest (top is Takao with 70%).